Linderhof is truly a cottage for it only has six rooms plus a screened in front porch and the breakfast room that we added three years ago. The number is small but the rooms are big so Linderhof lives bigger than it is. It's Monday and time for Show Off Your Cottage Monday at House In The Roses so please join Cielo for other Cottage Tours. 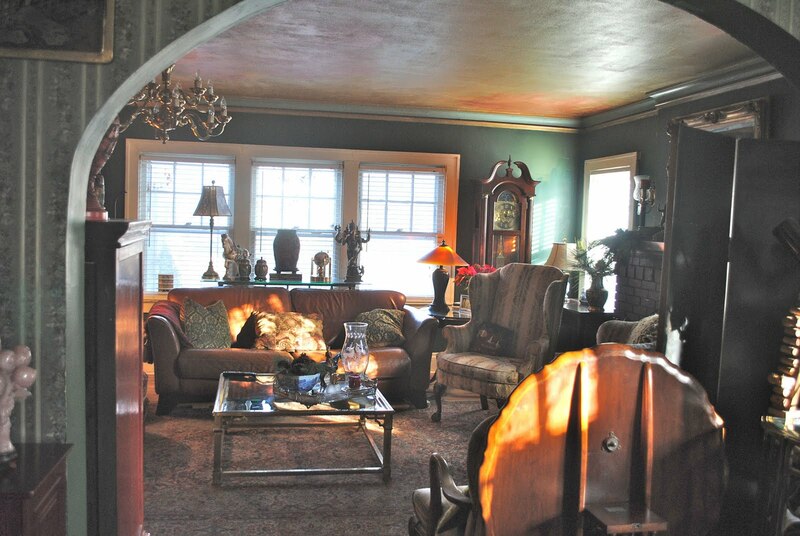 The front door opens directly into the living room which is not all that unusual for a 1920's house. Servants and calling cards were a thing of the Victorian past and so no hall was needed for visitors to wait in while the mistress or the master of the house was made aware that they had a visitor. It's a large room with the stairs at one end and a fireplace at the other. And it opens to the dining room. Taken from the dining room looking into the living room and the front windows of the house. 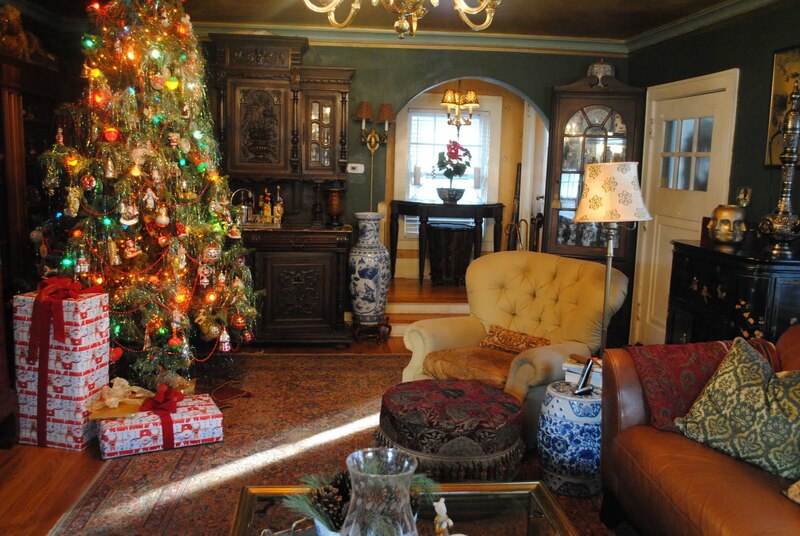 The fireplace is on the right and to the left across the room are the stairs to the second floor. It's a light and bright room -- made even more so after we took down the drapes and put up 2 inch blinds. The ceilings are not exceptionally tall -- only 8 1/2 feet but the crown molding which is original to the house adds great character. A leather sofa and a brass and glass coffee table. The living room taken from the foot of the stairs with the fireplace and it's two flanking windows. Two identical upholstered antique wing chairs -- bought (and upholstered three years apart). The one on the right cost all of $5 at an estate auction. The chair on the right is also antique upholstered in a companion fabric. Behind the wing chair next to the window is the Secretary whose top holds a collection of old books and small bits of blue and white china -- mostly from the early 19th century. It's "my" desk for my correspondence and bill paying. As you enter the home, this is the wall opposite the front door -- at Christmas, the tree takes pride of place opposite the front door. To the right is the stairs to the second floor. On the stair wall is our 1880's German sideboard which we use as a bar. The Asian cabinet to the left of the tree houses the television. Behind the tree are bookshelves for every living room needs bookshelves. Taken from the fireplace wall, a comfy chair and in the background, a corner cabinet full of more blue and white. There is a window at the bottom of the stairs with a table in front, two hurricanes and, this time of year, one of the poinsettias. The chair is a comfy easy chair -- one that you can curl up in and comfy enough to fall asleep in if you're really really tired! An ottoman is handy to put your feet up on. 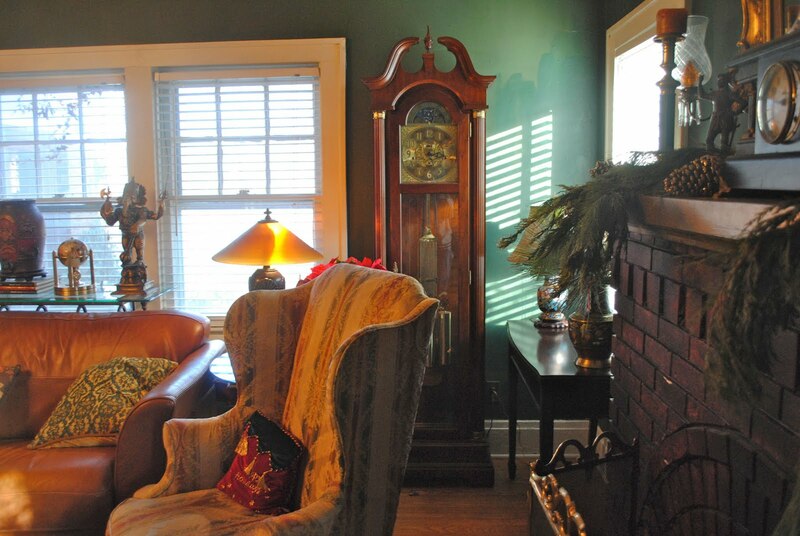 Next to the fireplace is a game table and my grandfather clock. An "always wanted" and I love to wake in the night and hear the chime! It resonnates throughout the house at night when all is still. It was bought with a small inheritance and it does remind me of my dear Aunt. 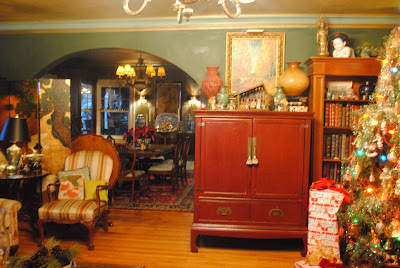 From in front of the living room windows -- you can see the arch that leads into the dining room. If you'll notice the doorway is arched and if you look at the fireplace, it has the same arch as does the entry to the stairs. We painted this room dark green shortly after we moved in. We've repainted twice since in the 20 years that we've lived here. I still love the color as much now, in 2010, as I did in 1989 when we first painted it. It was Husband Jim's choice of color and it goes well with the chairs and sofa. We live in our living room. It's where we often sip drinks and have nibblies before a dinner party. It's where we watch television every night. It's where I write my correspondence every morning. The living room is a difficult room for there are five windows, two big arches, a door and a fireplace which leaves very little wall space. But we have, I think, managed to make a workable arrangement. I love our living room and although I don't move furniture (except in December to put up the tree), the tabletops are ever evolving. But a house should not be stagnant. Things need a change up every once in a while. In Fall and December, that change up is through seasonal decorations but once January comes and in years when Ash Wednesday is in March, those changes come about in February when one is tired of the tabletops of January. I feel as if I've been an honored guest come for a cup of tea and a nosh! Thank you for the lovely narrative with the photos of your home. Your decor is beautiful and I admire how it is ever changing. Thank you for such a warm, inviting visit on such a cold winter day! It's so nice to see your living room. I feel that we've seen your dining room many times and it's great to see the rest of your wonderful home. Martha, Your living room is so warm and inviting. A perfect setting for tea, cocktails or just kicking back. Such a lovely post and I think every home should have changes from time to time to keep things interesting. I think taking the drapes down has had such an impact, I love letting more light in whenever possible. I've so enjoyed having a tour of your beautiful living room! You have such lovely pieces and furniture and it looks so cozy and warm. I can almost hear your clock ticking! 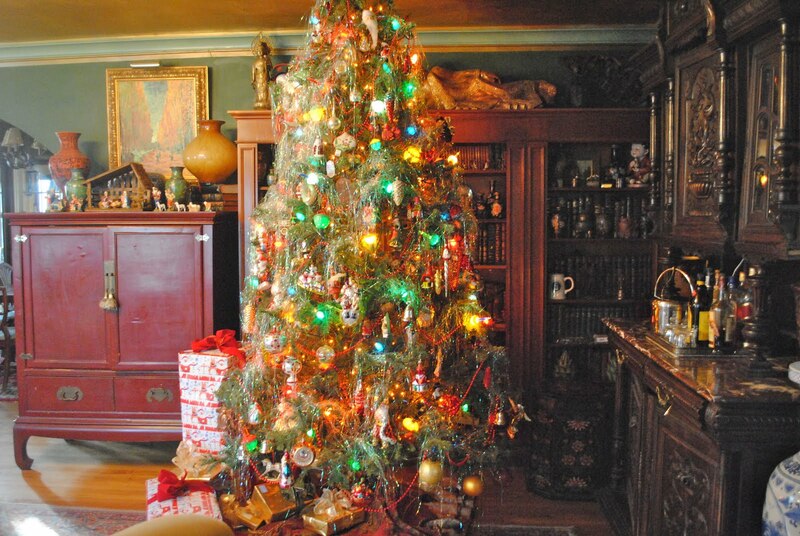 :) Your tree is so pretty too. Martha I so much enjoyed your tour of your beautiful home. You have some amazing things that you have collected in your living room...... it's all so warm and inviting. Such a lovely and festive Christmas tree and what a cute doggy. I really like how your furniture sits away from the walls with other pieces tucked behind where there is wall space. It looks very cozy and inviting. I am in love with your home, Martha! All your pieces are so charming and beautiful. I LOVE the way you painted the crown molding!! I can never get enough molding and The Ranch is sorely lacking in that feature. The wall color, ALL the colors in that room are perfect! Thank you so much for this wonderful tour and sharing your beautiful, beautiful living room. Your furniture is so unique and special. I love the lacquered-looking Chinese style cabinet (I can't tell if it is lacquered or not). Just wanted you to know I had to come back for another visit. It's a snow day here so sitting in front of my fire, gazing at your amazing room is heavenly. 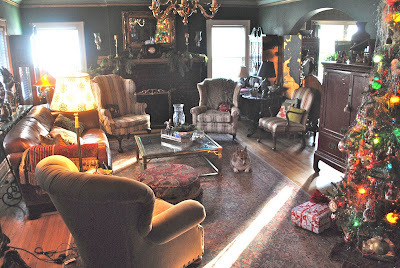 The rich tones of antique furniture seem so warm and friendly. I dream about shabby chic but just can't do it to my lovely antiques like yours! Your home is lovely. Hi Martha...What a lovely room! Such rich colors and unique pieces. Your tree is beautiful...and I adore your little Corgi! Thank you for such a gracious tour of your lovely home! Martha, Thank you for allowing us to visit in your lovely living room. It is a very comfortable and inviting room. It has everything one needs to comfortable and sociable. With all that comfort is still exudes elegance. I suspect you are one classy Lady.